Impact craters are a common feature on most planetary bodies because projectiles (such as meteoroids, asteroids, and comets) have collided with planetary surfaces for billions of years. Projectiles able to penetrate a planet's atmosphere impact the surface at a velocity of tens of kilometers per second with enough energy to generate shock waves in the crustal rocks. These shock waves propagate to produce craters by the ejection of vapors, melted rocks, hot particles and fragments, sheared and fractured rocks, and large blocks [Melosh, 1989]. Stratigraphy reverses during this process, with the deepest target material exposed closest to the crater rim and the most shallow material deposited farthest from the rim. Generally, impact craters have a circular outline, a raised rim, and a depth that is shallow relative to the diameter. The crater is surrounded by ejecta deposits that decrease in thickness outward from the crater rim; correspondingly, the detailed morphologies and radar backscatter characteristics of these deposits change systematically with distance from the crater rim. Because of the dense Venusian atmosphere, some aspects of crater formation and morphology on Venus are different from those on other bodies. These differences are of interest in themselves, but they do not overshadow the basic characteristics of impact craters. There is a general progression in morphology between large, intermediate, and small craters: large craters may have several rings and smooth floors; intermediate craters tend to have a central peak and smooth floors; small craters have a simple bowl floor that is rough. Impact craters exhibit a wide range of degradation on different planets, so they are useful indicators of resurfacing and modification of surfaces. On Earth, craters are rapidly degraded and destroyed by surficial weathering processes. In contrast, Venusian craters remain pristine because they are young, and there is very little weathering that affects them. Impact craters are found on both the plains and the highlands of Venus. Schaber et al. found the spatial distribution of craters to be highly uniform with a size-frequency distribution lower than those of the other terrestrial planets (except that of Earth), indicating a relatively young age of 0.5 Ga. The number of small craters is much smaller than that on other planets because of atmospheric filtering. One theory holds that the majority of Venusian craters appears pristine because the planet was resurfaced 0.5 Ga ago and there has been very little geologic activity and weathering since to degrade and destroy the craters [Schaber et al., 1992]. Phillips et al. found that the crater size-frequency distributions, locations, and preservation states implied a range of surface ages. Many craters display radar-bright or -dark halos, and a number of craters have extended deposits that are parabolically shaped and open to the west [Campbell et al., 1992]. A feature unique to Venusian craters is radar-bright outflow deposits that extend over great distances, following the local topography [Asimow and Wood, 1992; Schaberetal., 1992;Schultz, 1992]. Although radar images can be used to observe and discriminate the morphology, size, symmetry, slope, ejecta, crater-floor roughness, and other characteristics of impact craters, no single characteristic is a criterion for the impact origin of a crater; rather, an assemblage of criteria is required. The features that best determine an impact origin for a crater are (1) a circular rim crest outline, (2) flanks that gently rise  above the surrounding terrain, (3) floors with elevations lower than those of the surrounding terrain, (4) an ejecta blanket surrounding the crater, and (S) an inner basin that may be present in very large craters. Figure 7-1(a) shows the 48-km diameter Venusian impact crater Danilova, which lies on the plains; Figure 7-1(b) is a geologic sketch map. The crater has a central peak, a crater wall, a crater floor, an ejecta blanket, and crater outflow deposits. Figure 7-2 represents a schematic cross section through a central-peak crater such as Danilova. The ejecta blanket and the circular rim of a crater are very bright in the radar image because both are rough with many facets oriented perpendicular to the radar illumination; hence, a strong received echo results from the rim and the ejecta. Typically, the crater wall that slopes toward the radar appears compressed while the wall that slopes away from the radar appears expanded. Walls parallel to the illumination have intermediate brightness and widths. The diameter of a crater on Magellan images should always be measured from the northern rim to the southern rim, as this is the direction normal to the illumination direction where radar distortion is minimal. The apparent symmetry of a crater on an image depends on both the radar geometry and the angle of impact of the projectile that formed the crater. The smaller the incidence angle of the radar, the more foreshortening of crater walls and slopes that face toward the radar illumination. Craters produced by an impact that is normal to the surface tend to be radially symmetric: Rim crests have roughly equal elevations everywhere and are concentric with the crater floor outline, while flanks appear the same in all radial directions. However, most impact craters are produced by projectiles with trajectories that are oblique to the surface. When the angle is very oblique, the crater has a bilateral symmetry about the plane of the trajectory, with rim crests highest on the down-trajectory side and lowest on the up-trajectory side, while crater flanks extend to distances greater on the down-trajectory sides than on the up-trajectory sides. The outline of the crater rim crests is offset in the down-trajectory direction with respect to the outline of the crater floor. The degree of development of this bilateral symmetry increases with a decrease in the impact angle of the projectile (measured from the surface). Within and around impact craters, topographic undulations that are larger than the resolution of the image also modulate the backscatter echoes to reveal morphologic expressions of crater materials and their areal distributions. Venusian impact craters may have either a radar-bright or -dark crater floor, or both. The brightness of the crater floor in the Magellan images appears to depend on the incidence angle of the radar, the size of the crater, the terrain on which the crater formed, and the amount of infilling by lava or impact melt. In this chapter, each of these general radar responses will be discussed using examples from Venusian craters. In studies by Ivanov et al. and Basilevsky et al. , Venera radar images revealed about 150 impact craters with diameters from 8 to 144 km, which are distributed over less than 20% of the Venusian surface. The craters were classified into three morphological types according to the extent of their degradation [Ivanov, 1992]. Fresh craters were found to have radar-bright halos with bilateral symmetry. Mature craters showed no apparent halo, perhaps because the halo was removed by modification of the surface; mature craters were further classified into those that appeared fresh and those that appeared degraded. Basilevsky et al. compared halo-bearing craters in Venera 15/16 imagery (10-deg incidence angle; 8-cm wavelength) to Arecibo Earth-based radar images (40- to 70-deg incidence angle; 13-cm wavelength) and found that while some kinds of craters always had halos, others had halos only in Arecibo images but not in Venera 15/16 images. They interpreted this to be a time-dependent degradation of the impact-generated surface roughness. Figure 7-3 shows the crater Golubkina as seen by both Venera 15/16 and Magellan images. The 34-km-diameter crater is located at 60.5°N latitude and 287.2°E longitude. Magellan's resolution of the crater morphology is a tenfold improvement over that of the Venera image (120 m versus 1.5 km). The crater has a central peak surrounded by a smooth, radar-dark floor. The crater walls and ejecta are very bright due to great roughness and steep slopes that cause a large quasi-specular return. The crater appears to have a dark halo, perhaps from the shock wave associated with the impact or from the deposition of fine debris that subdued the roughness of the surrounding terrain. Schaber et al. have classified the Venusian impact craters seen in Magellan images into six morphologic types. (1) Multiringed craters are similar to the larger multiringed basins on Moon, Mercury, and Mars. They include all craters larger than 100 km in diameter. (2) Double-ring craters have an outer rim and an inner ring. Figure 7-1. Danilova, a 48-km-diameter central peak crater: (a) Magellan image- illumination is from the left at a 35-deg incidence angle; (b) sketch map, showing geologic units for Venusian impact craters. Figure 7-2. Schematic cross section for a typical central peak crater, such as Danilova. Figure 7-3. Golubkina crater as seen by (a) Venera 15/16 and Magellan combined and (b) Magellan only. The Magellan image was acquired at a 27-de" incidence angle and the Venera 15/16 image at a 10-de" incidence angle; because of the better resolution and larger incidence angle of the Magellan image, there are more variations in the Magellan imagery. Illumination is from the right for the Venera 15/16 image and from the left for the Magellan image. The inner ring is radar bright because it is rough and has steep slopes due to the arrays of peaks and hills rising above the relatively flat floor. Most craters with diameters larger than 40 km are of this type. (3) Central peak craters account for approximately 37% of the craters on Venus; they have central mounds or a radar-bright jagged central peak. (4) Craters with structureless floors generally have terraced walls and flat floors. (5) Irregular craters represent the smallest craters (less than 16 km in diameter), and their floors are usually radar bright because they are rough and complex. (6) Multiple craters are characterized by two or more craters produced by projectiles that impacted very close to each other; in some cases the crater rims may overlap. Simple bowl-shaped craters, which are quite common small craters on the Moon and Mars, are scarce on Venus. Instead, small Venusian craters form tight clusters and they overlap. The Venera 15/16 and Arecibo images of Venus reveal several circular features that resemble both impact craters and volcanic features. 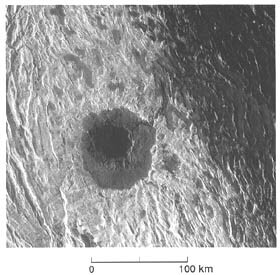 Cleopatra, 105 km in diameter and lying on Maxwell Montes, is one of these controversial features (Figure 7-4). Cleopatra was originally interpreted as a caldera on top of a giant volcanic construct [Masursky et al., 1980]. From the Venera 15/16 and Arecibo images, Basilevsky and Ivanov  interpreted Cleopatra to be a peak-ring structure, which supported an impact origin for the crater. However, the lack of evidence for crater-rim deposits, the large depth of Cleopatra, and extensive plains deposits to the east that apparently emanated from the crater led Schaber et al. to suggest a possible volcanic origin. Figure 7-4. Cleopatra crater. Once believed to be a volcanic caldera, this crater was shown by Magellan data to have an impact origin. A small ejecta blanket is visible surrounding the crater rim and an inner, radar-dark basin can be seen on the crater floor. Illumination is from the left at an incidence angle of 25 deg. ....possibly because the crater was produced on the highlands rather than the plains. The ejecta can be identified as such because they are rougher and have more large-scale slopes than those of the surrounding terrain. The crater wall at the right, which faces the radar illumination, appears compressed while the opposite wall appears extended. This is why more of the crater wall is visible on the side closest to the direction of radar illumination. The direction of illumination and the angle of incidence lower the apparent circularity of the crater outline in plan view and impart a bilateral symmetry. Flows of impact melt or lavas of impact-triggered volcanism breached the crater rim and filled the troughs in the upper-right corner of the image. These flows and the floor of the crater are radar-dark because they are smoother than the surrounding terrain, so more of the radar signal is reflected forward and away from the radar. A rougher terrain would be radar bright because more of the signal would be reflected back to the radar to produce a stronger echo. The surrounding tesserae are rough and have large-scale slopes, which result in extremely bright returns. A chemical transition at high elevations that leads to a high dielectric constant in the rocks is thought to accentuate the high radar reflectivity [Pettengill et al., 1988; Klose et al., 1992]. Mead crater, with a diameter of 280 km, is the largest impact crater on Venus (Figure 7-5). The inner ring is thought to represent the original rim of the crater cavity, while the outer scarp is thought to be the expression of a ring fault that has downdropped the flank terrace [Schaber et al., 1992]. The crater floor has a slightly higher backscatter than the surrounding plain. The surrounding plain is covered by fine debris that decreases the return to the radar, and hence it appears darker on the image. The floor of the crater has several large cracks that show as bright lines due to radarfacing slopes. Ejecta from the crater that appear as diffuse patches surrounding the crater rim are brighter than the surrounding plain because they are rougher and have more slopes facing the radar. At lower incidence angles, the difference in radar brightness between the ejecta and the surrounding terrain would be minimal because diffuse scattering dominates only at large incidence angles. However, at low incidence angles, quasi-specular scattering from radarfacing slopes of the ejecta will cause stronger backscatter than the flatter surrounding plain. Figure 7-5. Mead crater is the largest impact crater on Venus, with a diameter of 280 km. The crater has an inner and an outer ring and a small ejecta blanket surrounding the outer ring. The crater floor looks very similar in morphology to the surrounding plain. The dark vertical bands running through the image are artifacts associated with processing the SAR data. Illumination is from the left at an incidence angle of 45 deg. .....depth and physical properties of Venusian impact craters. The altimetry for the crater Mead is shown in Figure 7-6(a). The 100-m-contour intervals indicate an altitude above a 6052-km planetary radius. The drop in elevation from the crater rim to the center of the crater is approximately 1.0 km. This is quite shallow for a crater the size of Mead; it may be that Mead has experienced relaxation of its floor, or a large amount of material has flooded the crater floor. The rms slopes on the crater floor are about twice as high as those on the surrounding plain (2.6 deg vs. 1.3 deg). This indicates that the floor of the crater is rougher than the surrounding plain at the meter scale. Figure 7-6(b) shows the emissivity for Mead and the surrounding terrain, with a contour interval of 0.01. While the surrounding plain and western edge of Mead have values near 0.81, the eastern half of Mead has very low emissivities, with a low of 0.715. Because reflectivity is generally the complement of emissivity, the highest reflectivity values for Mead occur at the place of lowest emissivities, which is in the northeast of the crater floor. Furthermore, because the radar backscatter coefficient is partly a function of the dielectric constant, the low emissivity/high reflectivity may be due to a high dielectric constant on the eastern crater floor. This latter correlation is not seen in the SAR image of Mead, implying that some other scattering effect (e.g., volume scattering) may be causing the low emissivity on the eastern floor of Mead. The 63-km-diameter crater Yablochkina has one peak ring, seen on Figure 7-7 as an incomplete circle of bright hills surrounded by a darker, smoother floor. The peak ring is similar to the outer rim found on all craters, except that it is not as well developed. Both the peak ring and the outer rim are bright because they are rough and have radar-facing slopes. These slopes must therefore be oriented perpendicular to the radar illumination, which is from the left in this Cycle 1 image. The crater wall facing the radar (the right side of the crater) appears compressed compared to the wall on the opposite side-the same phenomenon that occurred on the image of Cleopatra, discussed earlier. A good estimate of the slope and depth of a crater can be calculated using the diagram shown in Figure 7-8. It should be noted that these equations apply only to craters with no layover (i.e., the slope of the crater wall is less than the nominal incidence angle) and craters that are symmetric. In the case of Yablochkina, the values of X and Y measured from the radar image are 4.35 and 7.5 km, respectively, and the incidence angle, 0, is 33 deg. Application of the formulas in Figure 7-8 results in a depth (H) of 1.02 km and slope ( ) of 9.8 deg. Altimetry for the crater shows a depth of 0.8 km. While the depth of the crater varies by only 0.22 km between the two measurements, caution must be used in calculating topographic data for smaller craters; the altimeter footprint for smaller craters may include both the crater floor and the surrounding rim and plains, which are at higher elevations. Hence, the depths measured by the altimeter for the smaller craters will generally be too shallow. The crater shown in Figure 7-7 has two other interesting features: a radar-dark halo and radar-bright outflow deposits. The crater and its ejecta are surrounded by a dark halo. 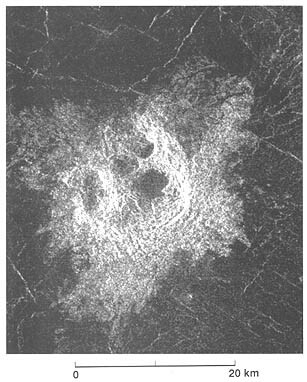 These areas of low backscatter cross sections partially or wholly surround approximately half of the impact craters on Venus [Phillips et al., 1991]. The Venera 15/16 radar images show very few craters with dark margins. It is likely that the dark margins seen on the Magellan images, which were taken at higher incidence angles, represent smooth areas with little surface roughness at the scale of the radar wavelength. Atmospheric shock waves produced as the meteoroid passed through the thick atmosphere may have removed wavelength-size structures from the existing terrain and pulverized the surface materials to produce these dark margins. Alternatively, fine debris produced by the destruction of the target material or the meteoroid as it passed through the atmosphere and exploded at the surface may have been deposited before the crater formed. In addition to dark halos, many Venusian craters have bright halos, also thought to have formed from atmospheric shock waves. Figure 7-6. Radiophysical properties of Mead crater superimposed on the SAR image: (a) altimetry contours at 100-m intervals-the reference altitude is 6052-km planetary radius, and the drop in elevation from the crater rim to the cen  ter of the crater is approximately 1.0 km; (b) emissivity contours at 0.01 intervals-the lowest emissivity is 0.715 on the eastern floor of the crater, while the western floor and the surrounding plain have higher emissivities. Figure 7-7. Yablochkina, a 63-km-diameter crater: (a) Magellan image- illumination is from the left at a 33-deg incidence angle; (b) geologic sketch map. Figure 7-8. Profile outline and equations showing calculations for crater depth and slope. These equations are applicable only for craters where no radar layover has occurred. ....and the surrounding plains do not support high dielectric constants as the cause of the high backscatter cross sections. Smaller impactors may be broken up as they enter the Venusian atmosphere [Basilevsky et al., 1987; Ivanov et al., 1992; Schaber et al., 1992]. Except for the smallest members of some crater clusters, no craters smaller than 3 km in diameter have been observed [Phillips et al., 1991]. Figure 7-9 shows an irregular crater of approximately 14-km mean diameter. The crater is actually a cluster of four separate craters in rim contact. The noncircular rims and multiple, hummocky floors are probably the result of the breakup and dispersion of a meteoroid during its passage through the dense Venusian atmosphere; subsequently, the meteoroid fragments impacted simultaneously to create the cluster. Meteoroids that would form craters smaller than the observed cutoff diameter of 3 km either are not able to penetrate the atmospheric column or they decelerate to velocities insufficient to form impact craters [Phillips et al., 1991]. However, the shock or pressure wave created as such a meteoroid travels through the atmosphere may still have energy sufficient to deform the surface. Figure 7-10 shows three dark splotches on the plains of Venus. The impact crater in the splotch at the right indicates that the meteoroid was not completely destroyed and reached the surface to produce a crater. Much of the meteoroid, however, was destroyed and its remnants and/or shock wave produced the large dark margin that surrounds the crater. The other two splotches, at near center and the extreme left, have no associated impact crater, indicating that only a shock wave disturbed the surface. Evidence that these splotches represent a deposit of material is the change in brightness of the underlying lava flows from the center of the splotches outward. The dark margin to the left has associated wind streaks, suggesting that the splotch is composed of material fine enough to be moved by the wind. Figure 7-9. Cluster of four craters in rim contact. A small projectile broke up in the atmosphere to form four smaller impactors that struck nearly simultaneously to form this crater cluster. Illumination is from the left at an incidence angle of 38 deg. ....eastern half of the crater can be seen on the far side of the rift. While the majority of large impact craters on Venus have floors that are radar-dark (probably due to flooding of the crater floor by lavas from below after the crater was produced), craters that have been modified by volcanism not associated with the impact process are rare on Venus. One such rarity is Alcott, a 63-km-diameter crater extensively flooded by lava (Figure 7-12). A remnant of rough, radar-bright radial ejecta is preserved outside the crater's southeast rim. The large, trough-like depression to the southwest is a rifle or channel through which lava once flowed; the very radar-bright eastern side and radar-dark western side indicate that this feature is a trough with steep slopes. The presence of partly lava-flooded craters like this one is important in understanding the rate of resurfacing on Venus by volcanism. The lack of flooded craters suggests that the surface may have been covered by lava flows about 0.5 Ga ago, burying all existing craters [Schaber et al., 1992]. According to this model, the craters now visible in the Magellan images represent impacts that occurred after this resurfacing event, and there has been very little volcanic and other resurfacing since. After Magellan completed one cycle of left-looking imaging, the radar geometry changed to obtain right-looking, constant, 25-deg incidence-angle coverage. Figures 7-13(a) and (b) are examples of a Cycle 1 (left-looking) and Cycle 2 (right-looking) image pair of the 26-km-diameter crater Guilbert. In the Cycle 1 image taken at a 20-deg incidence angle, the crater has a bright outer rim, a radar-bright central peak, and a radar-dark floor. The right side of the wall, which faces the radar, looks compressed compared to the left side of the wall, which appears extended. In contrast, the central peak is a topographic high so the radar-facing left side of the peak is compressed and the right side of the peak is extended. This geometric effect is similar to the radar geometry of the steep ridges in the highlands of Venus, where the ridges are geometrically distorted in the same manner (see Chapter 8). The Cycle 2 image obtained 243 days later at roughly the same incidence angle (25 deg) has equal but opposite illumination geometric effects because it was taken from the opposite side. Here the left side of the crater is compressed and the right side of the crater wall is extended while the central peak is compressed on the right side and extended on the left. The distal (left) side of the Cycle 2 crater wall shows large blocks of the wall that have fallen onto the adjacent crater floor, and this is why the wall does not appear as compressed as the distal (right) wall in the Cycle 1 image, where no blocks of the wall are seen on the crater floor. The crater ejecta look very similar in both the Cycle 1 and 2 images because they contain many rough blocks with facets oriented in all directions. Thus, these facets produce strong echoes from both the left and right illuminations. Because the incidence angle differs by only 5 deg between each image, the diffuse component, which contributes a large amount to the received echo, is roughly equal in both images. However, in cases where the incidence angle difference is great, the ejecta brightness and shape can change considerably. Figure 7-10. Dark splotches on lava flows. The splotch at far right contains a crater while the others (at center and far left) do not. The diffuse boundaries of the splotches and the wind streaks from the splotch at the left indicate that the splotches are composed of fine debris. Radar illumination is from the left at an incidence angle of 30 deg. .....same area imaged in Cycle 3 at a 24-deg incidence angle. The impact crater is De Lalande, 21 km in diameter and located on the distal flanks of the volcano Gula Mons. The crater has an outer rim but no central peak. The floor of the crater is both radar-bright and -dark; the dark floor represents a smooth, flat plain and the bright floor indicates a rougher surface. Surrounding the crater, but particularly to the north and east, are radar-bright outflow deposits. South of the crater, some of the preexisting radar-bright complex ridge terrain on which the projectile impacted is visible. Figure 7-11. Somerville crater is split in half by a riff valley. A north-south profile through the crater is visible in the rift. The eastern half of the crater is visible on the opposite side of the rift. Illumination is from the left at an incidence angle of 42 deg. .....component increases. The crater floor of the Cycle 3 image has a slightly higher backscatter than that of the Cycle 1 image because, at the smaller incidence angle, a stronger return results for relatively smooth surfaces. This is why the Venera 15 and 16 images, which were acquired at much smaller incidence angles (approximately 10 deg), appear much brighter than the corresponding Magellan images of the same areas. When both images of Figure 7-14 are viewed through a stereoscope, a three-dimensional image results. The height of the crater wall and the depth of the crater floor can be determined from these stereo images by measuring the parallax between the Cycle 1 and 3 images (see Chapter 4). Figure 7-12. Alcott crater was extensively flooded by lava. A remnant of radar-bright ejecta is preserved outside the crater's southeast rim. Illumination is from the left at an incidence angle of 27 deg. Figure 7-13. Guilbert crater: (a) Cycle 1 left-looking image at an incidence angle of 20 deg; (b) Cycle 2 right-looking image at an incidence angle of 25 deg. The images display opposite geometric effects in the crater rim and central peak, while the crater floor and ejecta are relatively unchanged. Figure 7-14. Left-looking stereo images of the crater De Lalande: (a) Cycle 1 image at a 44-deg incidence angle; (b) Cycle 3 image at a 24-deg incidence angle. The eastern crater wall is much brighter in the Cycle 3 image because the wall is closer to the normal of the radar wavefront than it is in the Cycle 1 image. - Asimow, P. D., and J. A. 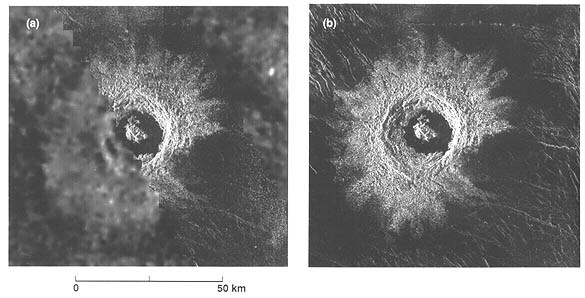 Wood, 1992, "Fluid outflows from Venus impact craters: Analysis from Magellan data," J. Geophys. Res., v. 97, p. 13,643-13,665. - Basilevsky, A. T., B. A. Ivanov, G. A. Burba, I. M. Chernaya, V. P. Kryuchkov, O. V. Nikolaeva, D. B. Campbell, and L. B. Ronca, 1987, "Impact craters of Venus: A continuation of the analysis of data from the Venera 15 and 16 spacecraft," J. Geophys. Res., v. 92, p. 12,869-12,901. - Basilevsky, A. T., and B. 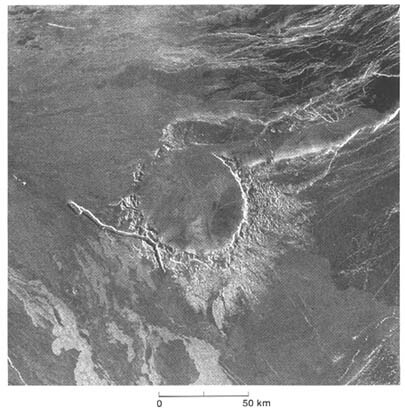 A. Ivanov, 1990, "Cleopatra crater on Venus: Venera 15/16 data and impact/volcanic origin controversy," Geophys. Res. Letters, v. 17, no. 2, p. 175-178. - Campbell, D. B., N. J. S. Stacy, W. I. Newman, R. E. Arvidson, E. M. Jones, G. S. Musser, A. Y. Roper, and C. Schaller, 1992, "Magellan observations of extended impact crater features on Venus," J. Geophys. Res., v. 97, p. 16,249-16,277. - Ivanov, B. A., A. T. Basilevsky, V. P. Kryuchkov, and I. M. Chernaya, 1986, "Impact craters on Venus: Analysis of Venera 15 and 16 data," J. Geophys. Res., v. 91, p. D414-D430. - Ivanov, B. A., 1992, "Impact Craters," in Venus Geology, Geochemistry, and Geophysics, Tucson, Arizona: University of Arizona Press, p. 113-128. - Ivanov, B. A., I. V. Nemchinov, V. A. Svetsov, A. A. Provalov, V. M. Khazins, and R. J. Phillips, 1992, "Impact cratering on Venus: Physical and mechanical models," J. Geophys. Res., v. 97, p. 16,167-16,181. - Klose, K. B., J. A. Wood, and A. Hashimoto, 1992, "Mineral equilibria and high radar reflectivity of Venus mountain tops," J. Geophys. Res., v. 97, p. 16,353-16,369. - Masursky, H., E. Eliason, P. G. Ford, G. E. McGill, G. H. Pettengill, G. G. Schaber, and G. Schubert, 1980, "Pioneer Venus radar results: Geology from images and altimetry," J. Geophys. Res., v. 85, p. 8232-8260. - Melosh, H. J., 1989, Impact Cratering-A Geologic Process, Oxford Monog. Geol. Geophys., no. 11, New York: Oxford University Press, 245 pp. - Pettengill, G. H., P. G. Ford, and B. D. Chapman, 1988, "Venus: Surface electrical properties," J. Geophys. Res., v. 83, p. 14,881-14,892. - Phillips, R. J., R. E. Arvidson, J. M. Boyce, D. B. Campbell, J. E. Guest, G. G. Schaber, and L. A. Soderblom, 1991, "Impact craters on Venus: Initial analysis from Magellan," Science, v. 252, p. 288-297. - Phillips, R. J., R. F. Raubertas, R. E. Arvidson, I. C. Sarkar, R. R. Herrick, N. Izenberg, and R. E. Grimm, 1992, "Impact craters and Venus resurfacing history," J. Geophys. Res., v. 97, p. 15,923-15,948. - Schaber, G. G., R. C. Kozak, and H. Masursky, 1986, "Cleopatra crater on Venus: New evidence for a volcanic origin," LPSCXVII, p. 762-763. - Schaber, G. G., R. G. Strom, H. J. Moore, L. A. Soderblom, R. L. Kirk, D. J. Chadwick, D. D. Dawson, L. R. Gaddis, J. M. Boyce, and J. Russell, 1992, "Geology and distribution of impact craters on Venus: What are they telling us?" J. Geophys. Res., v. 97, p. 13,257-13,301. - Schultz, P. H., 1992, "Atmospheric effects on ejecta emplacement and crater formation on Venus from Magellan," J. Geophys. Res., v. 97, p. 16,183-16,248.